Where are the majority of your files saved? For SCC students who log into campus computers using their student username (usually firstname.lastname), the default save location directs to their profile. These files are stored on a server, which has backups should anything bad happen to the server. For staff, the primary save location should be on a network drive. These files also live on a server that has periodic backups made. The one place that files should not be saved is the physical hard drive, commonly referred to as the C-drive or C:/. This disk is not backed up, so if something bad happens to the computer, these files could be completely lost. 1. Save files to an online storage location, like Google Drive, DropBox, Evernote, SkyDrive, etc. Benefit: Access files anywhere you have an internet connection. Benefit: Works on a variety of platforms, including phones. Con: Storage limits are typically smaller, and there might be a charge to get a larger storage capacity. 2. Save files to an external drive, like a USB drive or a larger external hard drive. Benefit: You can pick the storage capacity when you buy the device. The storage of USB capacity is constantly increasing and larger storage becomes less expensive. Benefit/Con: The device goes with you where ever you take it. Forgetful types might find this difficult. Con: Things can happen to these physical devices--a magnet could corrupt the files (this can happen if a USB drive is attached to keys! ), rain/water could cause damage, and the device could get lost. Everyone has their personal preference on file management. Just be sure you have a back up system in place when you don't save to a protected server. Trouble accessing something saved to a campus server? Contact TSS for help! Computer Lab Updates Coming Soon! Over spring break, TSS will be working hard to get two computer labs updated: the 4214 lab in the library and the 2329 lab for nursing students. The lab in 4214 will be updated to laptops running Windows 8.1. New tables and the ability to share multiple screens onto the larger screen will better facilitate group work and collaboration for classes held in the lab. The 2329 Nursing Lab will receive updated PCs that will run Windows 8.1. These newer computers will not support older storage devices like floppy disks. Although there will be a floppy disk reader available in the lab, nursing students will want to begin moving files stored on floppy disk to USB drives. Have you updated your devices lately? Security is a major part of why updates are issued for phones and computers. This week Mac has addressed a serious flaw in security. The fix for users is simple: update your device! Also, anyone using Windows XP will want to consider upgrading soon. In April 2014, Microsoft will no longer support Windows XP. What does it mean if my version of Windows is no longer supported? In general, your computer will not get updates, which means it will accumulate more and more security risks over time. For more precise directions, search for the phone model online. This post is for anyone using an Exchange email account and accesses their account through Outlook. Scrolling through the list of all the contacts in Outlook's Global Address Book can be cumbersome. Here is how you can improve you search for contacts when creating an email. Unlike searching with Name Only, More Columns search will not show any contacts until you type something in the search and hit enter/click Go. This step is the same as usual. Select a contact from the list and then click the To/Cc/Bcc line to add the contact. To select multiple contacts at once, select the first contact, hold the Ctrl key on your keyboard and click on each of the other contacts. Let go of the Ctrl key once you have made your selections, and click whichever To/Cc/Bcc line that is appropriate. If you have a section of contacts all grouped together in the list, click and drag your cursor over the contacts you want to add. A group of contacts can also be added using a Shift Click: Select first contact, Hold the Shift key, and click on the Last contact in the group. Once the contacts have been added, click ok to finalize addressing your email. The videos range between 2-4 minutes and cram in many of the new features. If the movie mentions a topic of interest, search for the topic at http://support.microsoft.com for more tips to utilize that feature. If you don't have Office 2013 yet, it is likely that you will by Fall 2014. Browser Toolbars out of Control? Me: "Wow, you have a lot of toolbars installed. Do you like having those?" Me: "Do you know where they came from?" Me: "Do you want me to remove those?" If you can relate, roll up your sleeves and lets do some spring cleaning! It's all good if you want to have the toolbars installed. Just be aware of the choices that show up during installation and read through the installation process. Cancel and do some research if wording sounds at all fishy. Unfortunately, it is possible that just removing the toolbars isn't enough. Some toolbars have bad intentions and can slow down the entire system. I found that Enigma Software Group has an extensive list and explanations of malicious toolbars. Here is an article that delves deeper into what's behind malicious toolbars, symptoms you may experience, and preventative actions you can take: Sneak Attack--Those Annoying Toolbars You Never Wanted. Google is streamlining their services which means students can expect some changes when logging into their school email. The old address, http://go.shoreline.edu, will still work, but will no longer have the SCC look and feel. The login site will look the same as a personal Gmail account and can be also accessed at http://gmail.com. Most importantly, students will need to use their entire email address to login. If you already have another Gmail account associated with your browser, you will need to add an account. One of the fastest way to get meaning from data in Excel is to insert a table. Here are some tips for getting started with Excel Tables. These tips will work for the 2007, 2010, and 2013 versions of Excel unless stated otherwise. Select a cell within your data area. Go to the Insert Tab on the Ribbon and select "Table"
Normally in Excel, Tab moves the cell selector right and Enter moves the cell selector down. In a Table, Tab moves to the next cell in the Table. In other words, it will move right until the last column in your table, and then it will move down to the first cell in the next row. If you're at the end of your data set, a new row is automatically added to the Table. For this next part, a cell within your table must be selected. Go to the Table Tools Design Tab. Check the Total Row box. This example is shown in 2013, but you will still see the same option boxes in the previous versions. 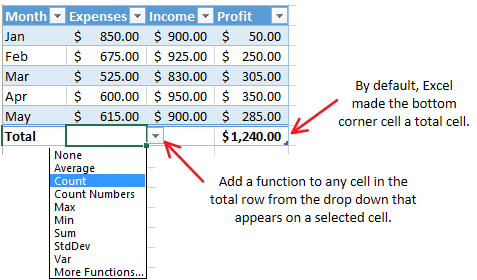 Add formulas to the Total Row. 4) Switch a table back to regular cells. Select a cell in your table. From the Table Tools Design Tab, click convert to range. Formatting and Total Row stay put, but the other tools from the Table are removed. As the Table Tools Design Tab suggests, Excel can do much more with Tables. Check out Microsoft's Support site more helpful articles and videos. The search feature works rather well if you want help with something specific. For example, type "Excel Tables" or "Excel PivotTables" to continue learning about tables. Come to the lab with clean hands and do not bring food. For one thing, 'tis the season for germs to take hold. Also, although the keyboards and tables are cleaned periodically, crumbs in the keyboard or grimy keys from dirty hands can build up over time. Log into the computer using your student credentials, lock the computer when you step away, and log out when you are done. Using your student login allows you to save files to your profile, which follows you where ever you login. You will more likely be able to recover work if something terrible should happen while you're in the middle of working. To lock your computer when you step away, use the keyboard: Windows Key + L. Locking when you step away and logging out when you are done keeps your information and files out of the hands of whoever sits down after you. Report any issues you come across. TSS strives to have computers and printers in good working condition. If something isn't working for you, it could go unnoticed if you do not report it. If headphones don't get sound, there's a fix! Report issues to Erin Greenwood, the computer lab manager, or the TSS office. They will want to know the computer number and the problem. This computer lab is a dedicated quiet, independent study environment. If you need to do group work, look into checking out one of the group study rooms offered by the library upstairs.